1919: Launched by Brown’s Shipbuilding & Dry Dock Co Ltd, Hull (Yd.No.1) (“Admiralty drifter”) for The Admiralty as CHIMERA (Ad.No.4146). 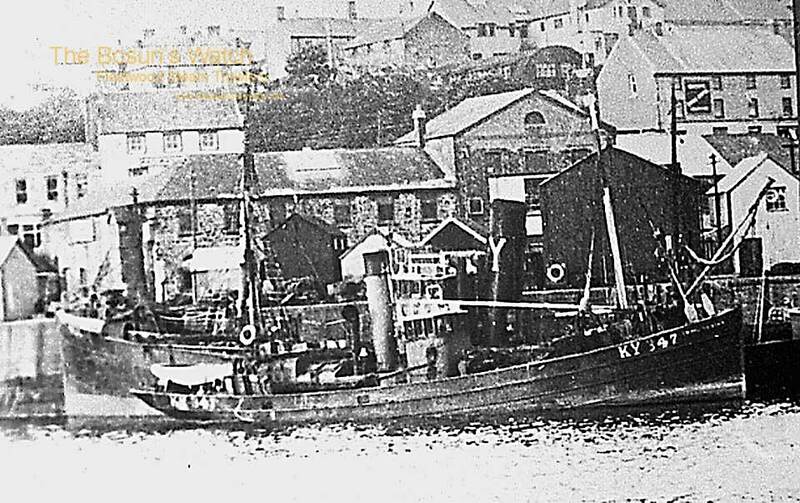 16.7.1920: Completed as a fishing vessel. 21.9.1920: Transferred to The Fishery Board for Scotland, Edinburgh for disposal. 1920: Sold to J. R. Mitchell, Peterhead. Registered at Peterhead as J. R. MITCHELL (PD443). 1920: Sold to Andrew Buchan Jnr, Peterhead & others (Andrew Buchan Jnr, managing owner). Registered at Peterhead as TWINKLING STAR (PD443). 1932: Sold to John Muir (Keay), Cellardyke & others (John T. Graham, Anstruther, manager). Peterhead registry closed. Registered at Kirkcaldy (KY347). 8.10.1937: In Yarmouth harbour in collision with steam drifter RENASCENT (LT288) and sustained damage. 1938: Sold to W. Wilson, North Shields & others. 12.9.1939: Requisitioned for war service on harbour defence patrol (Hire rate £32.0.0d/month). 1.1942: Employed on Examination service (Hire rate £26.0.0d/month). 1945: Sold to Boston Deep Sea Fishing & Ice Co Ltd, Fleetwood (B. A. Parkes, manager). 30.6.1945: Returned to owner (David F. Cartwright MBE MC, Gorleston, manager). 1946: Sold to The Adam Steam Steam Fishing Co Ltd, London (David F. Cartwright MBE MC, Gorleston, manager). 3.1949: Sold to Merchants (Milford Haven) Ltd, Milford Haven (Frederick Walter Goffin, Hakin, manager). 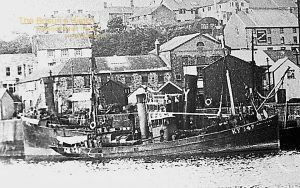 8.3.1949 – 27.5.1955: Seasonal white fish trawling from Milford Haven. 1955: Laid up at Milford. 10.5.1956: Registered at Milford as MERCHANT VENTURER (M49). 19.4.1959: Last landing at Milford. Laid up. 1.1960: Sold to BISCO and allocated to John Cashmore Ltd, Newport, Monmouthshire for breaking up. 17.1.1960: Sailed Milford for Newport (Sk. Tom Bartlett). (Seasonal at Milford as TWINKLING STAR – 8 Mar – 4 Nov 1949; 14 Mar – 4 Oct 1950; 8 Mar – 4 Jul 1951; 10 Mar – 26 Aug 1952; 22 Mar – 7 Dec 1953; 19 Mar – 10 Oct 1954; 6 Mar – 27 May 1955. 21/06/2011: Page published. 5 updates since then. 31/12/2018: Removed FMHT watermark from image. This entry was posted in Drifter/Trawler, Steam Trawlers, Steamers (Picture) and tagged Admiralty Drifter, Boston DSF & I, Drifter/Trawler, Parkes on July 21, 2011 by Fred Smith.